The Twelve Disciples wall chart gives descriptions and details of each of Jesus' 12 disciples. Includes facts such as name, personality and character, key verses, relationship to Jesus, strengths and weakness, and stories about their life, death, and ministry. Great for discussing God's strength and forgiveness in the lives of everyday people. Wall chart: 19" x 26." Pamphlet is great for students. Fits inside a Bible cover: 8.5" x 5.5" and unfolds to 33" long. 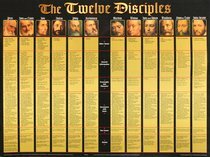 About "Wall Chart: Twelve Disciples (Laminated)"